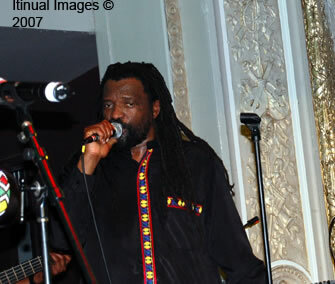 Big Up Radio is deeply saddened by the tragic loss of African reggae legend, Lucky Dube. Lucky was gunned down yesterday evening in Rosettenville, Johannesburg, South Africa, in an attempted car jacking as he was dropping off his children at a relative’s home. It has been reported that Lucky tried to flee the scene but was mortally wounded by the gunman in his attempt to steal Lucky’s vehicle. It is also reported that he died almost instantly from the gunshot wounds. This is such a tragic end to a purposeful life, as well as a brilliant career. Lucky’s music spans twenty-five years solidifying this artist as an Icon of African reggae singers. He had released twenty-two albums in English, Zulu and Afrikaans. His latest album "Respect" was released in 2006, on the South African "Gallo" label, and was distributed through a deal with Warner Music International throughout Europe. I feel very blessed to have been at Lucky Dube’s last performance in the U.S. at Ruby Skye in San Francisco, California. All I can say is that it was like no other reggae show I had ever been to before. I had seen Lucky Dube perform at festivals, but this was his show, he headlined and the vibes were joyous and uplifting. Opening the concert at one of San Francisco’s more upscale clubs were two Hawaiian reggae bands Servant, and Jahmana. In the crowded nightclub in S.F’s famed theater district, people of Polynesian decent danced all night next to people of African, Asian, Latin, Caribbean and European decent. Just thinking about the show makes tears well up as I write this. This man brought together so many people, from such a wide array of backgrounds to rejoice in harmony and oneness. I was not aware at the time what a huge Pacific Islands fan base Lucky had held until informed by Jahmana’s lead singer Mele Viloria that he had played in Hawaii, Fiji and the Solomon Islands. There was such a beautiful rainbow of Jah’s children present that I now know this was indeed a divine experience that all in attendance will forever cherish. Lucky is survived by his wife Zanele, and his seven children, Bongi, Nonkulueko, Thokozani, Laura, Sivanda, Philani, and his new three month old baby Melokuhle. As the world now mourns this senseless loss, let us all say a collective prayer for his family and give thanks for a musical legend that has given so much to the global community. You can send letters of condolence and support to lucky@gallo.co.za or fax to +27 (0) 11 340 9471.